I just love Mary Kay and I love trying out new looks. As a busy Mom, I do not have a ton of time to research the latest looks, and I know many other Moms feel the same way as me. 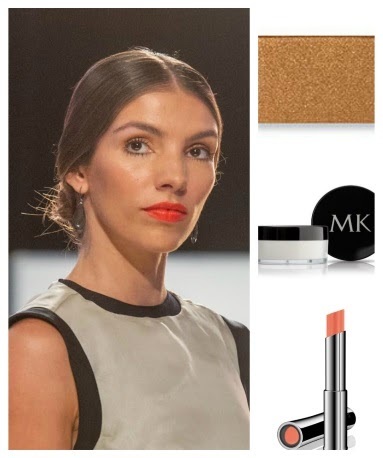 Mary Kay has made it easy for you and me both my providing quick and simple instructions for some of the most fashionable looks out there right now! I recently was lucky enough to receive a few products from Mary Kay to achieve the "Uptown Chic" look. This is not a look I typically wear, but I am amazed at how simple it is to achieve, and how sassy it looks! I feel really pretty while wearing it! Sweep a rich, golden eye shadow like Mary Kay® Mineral Eye Color in Amber Blaze all over the eyelids and pat a lighter shade like Glistening Gold onto the inner corners, then top with two coats of black mascara. For flawless skin, brush Mary Kay® Translucent Loose Powder to the face and neck line, and add a touch of blush to apples of cheeks. Finish the look with an orange-red lipstick like Mary Kay® True Dimensions™ Lipstick in Tangerine Pop straight from the tube. Shades Used: Amber Blaze and Glistening Gold. For less than $50, you can achieve this very cute and stylish new look from Mary Kay! The makeup is all long lasting and the look is a fun, flirty feel that I love! Do you think this is a look you would enjoy this holiday season?